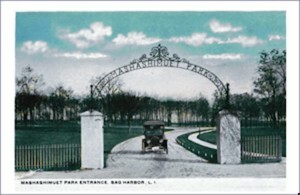 In 1908, Sag Harbor benefactress, Mrs. Russell Sage, began the process to create what would later be named Mashashimuet Park for the youth and families of the area. Half-mile oval track built for carriage team races, trotting and walking races. produce, poultry, flowers, and baked goods. Exhibition building destroyed by fire. Great Bicycle Tournament – over 1,000 spectators. Park grounds in deteriorated condition. 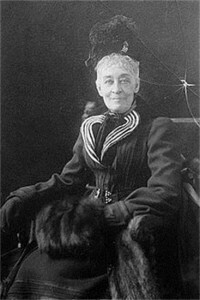 Mrs. Russell Sage purchases the park from Park and Fair Grounds Association and builds the house for a park superintendent, a playground, two tennis courts and an athletic field. William Wallace Tooker names the park “Mashashimuet”, Algonquin for ‘Place of the Great Springs’. Mrs. Sage purchases the lands surrounding Otter Pond to add to the Park property. 13 houses are moved off-site and given to needy families. Baseball, tennis, track and field events take place. Children’s Garden planted with 114 plots for individual children to tend. Weekly band concerts in bandstand on top of hill. Pierson High School students earn and contribute 10 cents each for a flag pole. acknowledging Mrs. Sage’s interest in children. Mrs.Russell Sage turned the park and library properties over to the Russell Sage Foundation. Death of Mrs. Russell Sage at the age of 90. Sage Foundation deeds the Park property to the Park and Recreation Association of Sag Harbor, N.Y.Inc., a non-profit organization chartered by the New York State and establishes by-laws and a board of directors to run the Park.